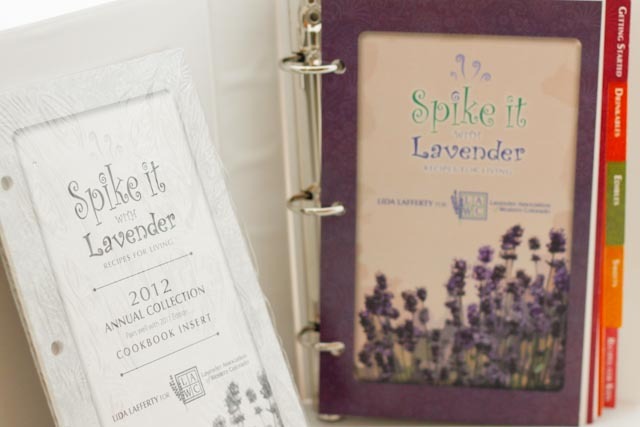 The charming book, Spike It with Lavender: Recipes for Living by Lida Lafferty, offers many creative ways to use lavender. The book presents a collection of ideas and recipes for drinks, savories, sweets and even household items such as lavender dryer bags and lavender mist. I find many reasons to praise this book and rejoice in its genesis. 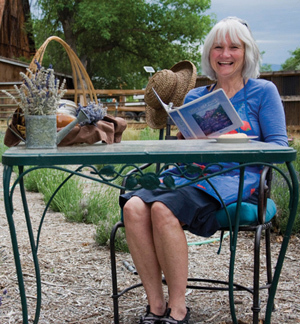 Lafferty, a speech pathologist living in western Colorado, never intended to grow lavender. She certainly couldn’t have guessed that she would ever create a lavender recipe book. 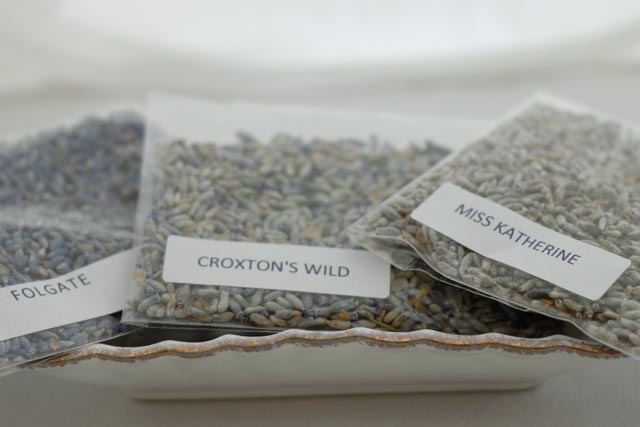 Honeybees sparked Lafferty’s interest in lavender. In 2008 she worried about her honeybees and wanted to give them a healthy and abundant food source. 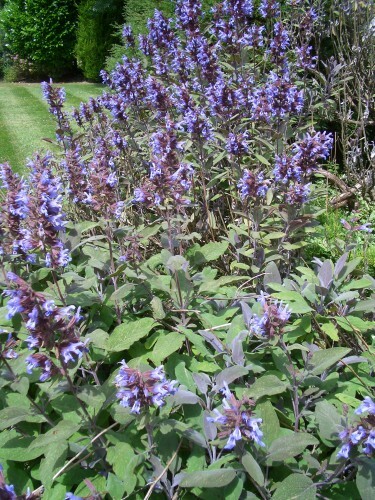 From Colorado State University’s Extension office, she learned that honeybees thrive on sage, yarrow and lavender. 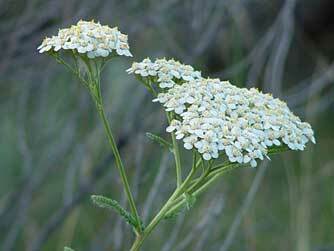 Lafferty was already growing sage and yarrow on her 2 ½ acres in Grand Junction. For the sake of her bees, she put in 75 lavender plants and added more the next season. All summer Lafferty’s lavender filled her fields with fragrant purple blossoms. Her honeybees hovered over the flowers, foraging for pollen. One day Lafferty was harvesting lavender. Everywhere she looked, she saw honeybees enjoying the magnificent flowers. Lafferty felt guilty about taking away the bees’ food. She found herself talking to them, saying, “Okay ladies, half of this lavender belongs to you, I get the rest.” Lavender had become a character in her story. Lafferty joined the Lavender Association of Western Colorado. Colorado’s arid climate, high altitude and alkaline soil gives the herb everything it desires. Farmers planted lavender as a cash crop. It adds to income from cherries, peaches and wine grapes. The association published Lafferty’s book in 2011. Spike It with Lavender: Recipes for Living contains a collection of recipes. Well-known chefs, lavender growers and talented home cooks contributed recipes. This approach yielded diversity; each recipe reflects the creator’s experience and personality. Professional chefs relied on their culinary training and skill in pairing flavors and textures, however some had not yet discovered lavender as a culinary ingredient. Lafferty sent them lavender honey and lavender buds. She asked them to experiment with it and contribute their recipes. Lafferty converted these chefs from skeptics to believers. Their recipes showcase tasty ways to use lavender. Growers with years of experience using lavender generously gave many recipes to this book. From this group, special mention goes to Roxi Lane from Dayspring Farm for sharing her “top secret creations” such as Dayspring Farm Lavender Espresso Brownies. Also Paolo Legarre’s Sage Creations Lip Balm stands out for its simplicity. From talented home cooks, the book gives us family favorites that have been perfected over generations. These range from Gram Jane Molasses Cake with Lavender contributed by Julie Zahniser (in honor of her mother) to Sheila’s Herb Chicken Stew contributed by Nancy Lofholm. Amy Nuernberg created the book’s artistic cover and tabs. Artist Susan Metzger contributed her batik design along with original art and local photographs. These work well with Lafferty’s clever idea to use a ring-binder for easy reference while cooking and to enable expansion. The 2012 recipe collection has recently become available. She’s now collecting recipes for the 2013 edition. If you want to contribute one of your recipes, you can find her submittal guidelines on the Lavender Association’s website. March 31, 2013 is the last day for submittal. Bound in a Three-ring Binder, the Book Expands with New Recipes Each Year. Another helpful feature of this book informs readers of the wide range of lavender varieties, each with their own flavor and fragrance profile. Some are sweet, others spicy; some are subtle, others bold. 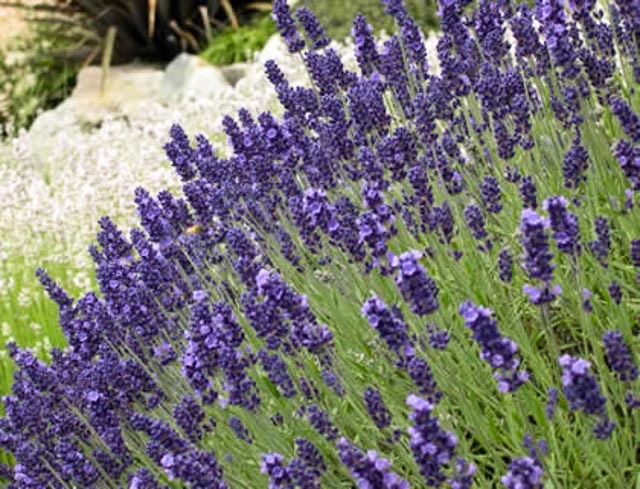 For culinary use, Lafferty recommends English Lavender which comes in hundreds of varieties. Because many recipes in the book specify certain varieties such as Miss Katherine, Folgate or Croxton’s Wild, readers discover many flavor choices. When the association held their first lavender festival in 2011, Lafferty’s suggestion came to fruition. 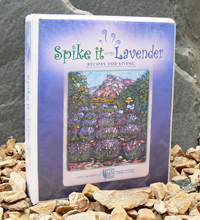 Many festival attendees went home with a copy of Spike It with Lavender. The 2012 festival attracted about 2000 people. The 3rd festival is scheduled for July 12-14, 2013. 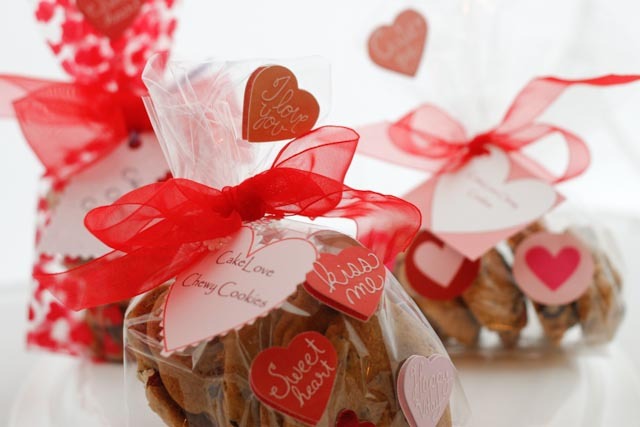 For Love & Romance, Bake CakeLove Cookies for your Sweetie! Preheat oven to 300 to 315 °F and line a cookie sheet with parchment paper or a non-stick baking mat. *Note: To make Lavender-Infused Honey, combine ¼ cup to 1/3 cup dried lavender buds and 1 cup honey in a jar with a tight-fitting lid. Let stand, turning the jar upside down periodically. After a week, discard lavender buds by filtering through a sieve. It’s now ready to use. Mix honey, sugars and zest in stand mixer fitted with flat paddle. Slowly add in melted butter and vanilla extract. Add in egg and yolk. Stir to combine flour, soda, salt and cinnamon, and then add to mixer. Add mix-in of your choosing and stir until combined. The dough should come off the side of the bowl and barely feel tacky. Add a touch more flour if it’s very sticky. Scoop out the dough with a trigger ice-cream scooper. Lightly press to flatten to ¼” to ½”. Bake for 13 to 15 minutes, remove from oven to cool and serve warm. Store any leftover dough in an airtight container in fridge for up to 2 weeks. Warren says there’s a fair amount of tolerance in the recipe to withstand variance in the art of mixing and atmospheric conditions (temperature and pressure). So here’s what you need to know. It’s soft, not crispy, because of the honey. It’s chewy! No worries about altitude adjustments. It’s scrumptious, one of the best cookies I’ve ever tasted. Make them after school with your children, after work, or at midnight. Linger with good talk, a glass of milk, and this good cookie.